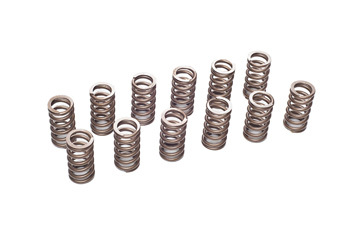 Our High Performance Valve Springs are a dual-spring interference design that is made from pure H-11 alloy. Each spring is wound to meet our rate requirements and is shot-peened for stress relief. The proprietary interference fit we use helps to control harmonic resonance, that naturally occurs in springs, across the entire rev range. In our dual-spring configuration, should something happen to one spring, the other can prevent the valve from dropping and causing catastrophic engine damage. Our VAC springs are ready to be set to the ideal seat pressure for performance camshafts from Cat, VAC, Schrick and others. You may adjust spring seat thickness to adjust seat pressure. These springs are fully compatible with both the OEM retainers or our VAC Light weight Steel-alloy or Titanium retainers, found below. Designed with the aid of a BMW Formula-1 engineer; these springs are guaranteed to out perform the competitions valve springs at any price. From Myles Wilson of Hobart, Australia on 9/16/2012 . From kilgojr of Hoover, Alabama on 4/17/2012 .